The Addis Abeba prison administration Qilinto prison police have this morning brought prominent opposition figure Bekele Gerba and the 21 others in the same file for a hearing at a court all barefoot. The detainees were also wearing mere shorts and t-shirts when they appeared at the Federal High Court 19th Criminal Bench here in the capital. Once inside the court room the detainees, through Bekele Gerba, first secretary general of the opposition Oromo Federalist Congress (OFC), told the judges that the police have come to their cells in Qilinto, a prison in the outskirt of south of Addis Abeba, yesterday and stripped them all of their clothes and shoes to prevent them from wearing black upon appearing in court this morning. On May 11 the police have failed to bring the 22 detainees, all charged with Ethiopia’s infamous Anti-Terrorism Proclamation, ATP, to the court because all them were wearing black to protest their arrest. However, the police have told the court this morning that they didn’t bring defendants during the last hearing because they have not received a letter from the court. The judge told the police at the court this morning that the police officers on duty on May 11 must appear in court to explain the real reason. Bekele also told the court that he and his co-defendants were subjected to torture and other forms of physical and psychological abuses inside the prison and requested the judge for a change of prison. But the judge denied the request. The 22 defendants were all arrested between November and December 2015, shortly after the start (and in connection with) Oromo protests in November that gripped the nation for the next five months. Defendants include several members of OFC, students and civil servants who came from various parts of the Oromia regional state. Prosecutors have charged the 22 with various articles of the ATP. The charges include, but not limited to, alleged membership of the banned Oromo Liberation Front (OLF), public incitement, encouraging violence, as well as causing the death of innocent civilians and property destructions in cities such as Ambo and Adama, 120km west and 100km east of Addis Abeba during the recent Oromo protests in Ethiopia. This morning all of the defendants have presented a written defense statement. The court adjourned the next hearing until June 27. In a related development, the police at Qilinto have failed to bring this morning 16 other individuals, all from the Oromia regional state and were detained in connection with the #OromoProtests, to the court. The 16 detainees, under the file name of Tesema Regasa were first brought to the court on April 26. They were subsequently charged with the ATP and have, last month, presented their defense statements to the court. Today’s court appearance was adjourned to hear prosecutors’ counter response for the defense statements. The court re-adjourned the next hearing until June 15. Wondimu Ebbissa, who is representing Bekele Gerba et.al, said last month that more than 80 defendants, including Bekele Gerba et al, were held in Qilinto and a further 97 were believed to be either at the Ethiopian Federal Polcie Force Central Bureau of Criminal Investigation, known in Amharic as Ma’ekelawi, or the Addis Abeba police prison facility near it. All of them are detained in connection with #OromoProtests. 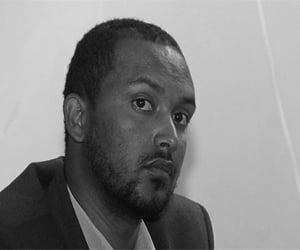 In a separate development, the Federal High Court 19th Criminal Bench yesterday adjourned the hearing for Yonatan Tesfaye, former spokesman of the opposition Semayawi (Blue) Party, until June 21. The court received Yonatan’s defense statement in its hearing and adjourned the next hearing to receive prosecutor’s counter statement. Last month prosecutors have charged Yonatan with ATP and have presented as evidence the defendant’s Facebook status updates during the #OromoProtests. The charges against Yonatan allege that he was posting inciting message on his Facebook, encouraging protesters to loot and destruct properties. Charges also allege Yonatan was calling for regime change through violence. ” Beellama keenna isa dabre irratti uffata gurraacha mana murtiitti dhiyaachudhaaf uffanne baafadhaa nuun jedhan. Nutis hin baafannu jennee mormine. Uffata barbaanne kaawwachuun mirga heera biyyattiittiin nuuf kenname jenneen. Nuti uffata gurraacha kan uffanneef Lammileen Sabaan Oromoo ta’an Kuma 50 ol mana hidhaa keessatti kan argamaniifii dabalataan waggaa kana keessatti qofa lammiilen Oromoo 200 – 300 ajjeefamuu isaaniitiif gadda nutti dhagayame ibsuuf ture. Gochi nuti raawwanne hundi seera fi hojmaata mana sirreessaa haala hin tuqneen ture. Kuni gonkumaa hin ta’u jedhanii nu dhoowwan, nutti dallanan, nu sodaachisuudhaaf yaalan, nu arrabsan. ” Kaleessa sa’aa booda namoonni mana murtiitti dhiyaannu adda baafamne akka dhufnu godhamne. Eddoo jirruu uffata keenya qabannee akka baanu godhame. Uffata keenya keessaa uffata gurraacha barbaadanii fudhatan. Nutis ” uffata keenya hunda isaa nuuf deebisuu qabdu jennee gaafanne. Isaanis gara mana dukkanaa fuudhanii nuun deeman. Nu keessaayis namoota tokko tokko garmalee tumaadhaan dararan. Namootni tumamanis asuma waan jiraniif dhadacha fuulduratti waan irra ga’r kana ibsachuu ni danda’u. Uffatni keenya hundi isaa lafarratti waan bittinneeffameef hidhamtoonni biroo kan barbaadan keessaa fudhatan. Isa hafe fidanii kutaa keenya keessatti darban. Hanga har’aatti midhaan hin nyaanne. Harki keenya hamma ganamaatti Kaateenaadhaan hidhamee ture. Gochi suukaneessaan nurratti raawwatame hundi kan Oromummaa keenyarratii xiyyeffateedha. Lammiin sabaan Oromoo ta’e qofti filatamee garmalee tumamaa jira. Eddoon itti hidhamne kan ilmi namaa sababa sabummaa isaatif qofa itti adabamuudha. Anaanis ‘ Kan kana godhu sihi, si arganna’ naan jedhanii jiru.